The picture was created in 1635. According to the biblical story, Abraham was supposed to sacrifice his son Isaac at the command of God. The hero did not hesitate for a minute. The rite was to take place on the mountain. Abraham and Isaac came there only on the third day. When Isaac was already laid on the altar, an angel called from heaven. He asked Abraham not to kill his own son. The victim was a ram. The Lord made a solemn oath that the posterity of Abraham would be multiplied many times. In the 30s, Rembrandt wrote several grand paintings on religious themes. The most famous “Sacrifice of Abraham.” The picture is filled with pathos and incredible dynamics. The artist was attracted by images filled with heroism and at the same time drama. He preferred constructions, creating an external effect. The painter skillfully played with contrasts of light and shadow. He skillfully uses sharp angles to express the main idea of ​​the picture. Rembrandt captured in his picture Isaac, who limply lies on the famous place where the fire for the sacrifice will be lit very soon. We do not see his face, as it is covered by the hand of Abraham. This characteristic gesture conveyed maximum determination, reaching despair, and at the same time incredible pity. The hero does not want his son to see who will kill him. 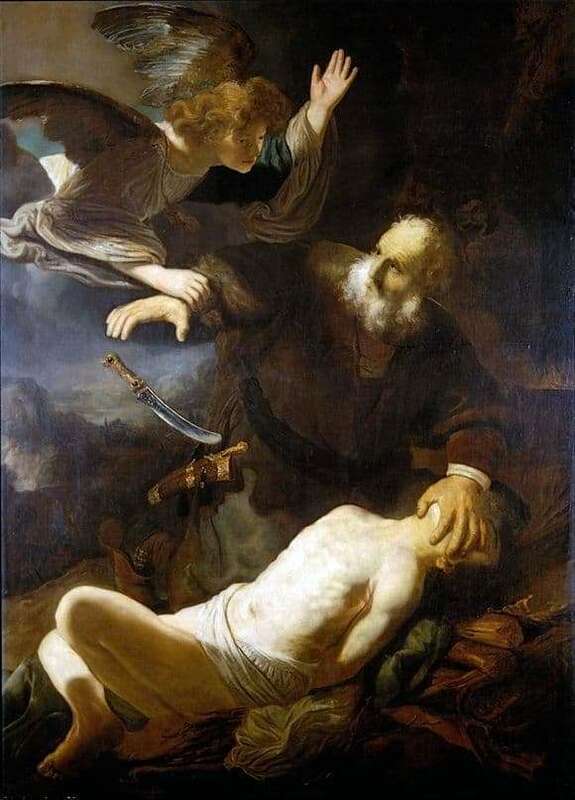 We see Abraham turning to the angel. It is he who stops the hand at the very moment when the dagger is already brought. The imperfect murder weapon falls limply. The artist used a greenish-gray tone. But the shimmering of the dagger brings tension. It is enhanced by the light that comes from the body. The painter manages to create an image that is as truthful as possible from a psychological point of view. Rembrandt took this story by chance. He wanted to test his skill and maturity. Sacrifice is the main theme of many of his works. Such a grandiose creation leaves an indelible impression in the soul of everyone who sees this canvas.